It was all agreed that the worlds are all interconnected… One day you will see Black Adam go at it with Superman or Batman or any of the DC characters. But that said, there’s a great independence to Black Adam from the DC world, allowing us to inject, not only viciousness, but also winking humour. In terms of power levels, Superman and Black Adam are about equal, so a brawl between them might even be more intense that what went down with Zod in Man of Steel. 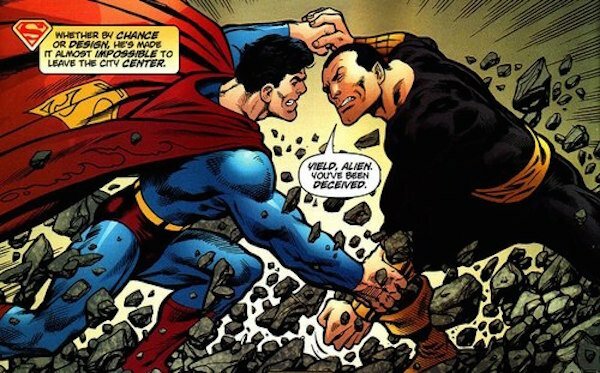 In fact, if the DCCU Superman also has a weakness to magic, then Black Adam actually has an advantage over the Kryptonian, and a fight between them could go similarly to the animated short film Superman/Shazam! : The Return of Black Adam (where Supes was barely able to hold his own). As for Batman, unless you’re one of those fans that believes if Batman can defeat anybody with enough prep time, even the hero's Kryptonite-powered Dark Knight Returns armor probably won’t last long against Black Adam. Of all the Justice League characters, really Wonder Woman would really be the most worthy opponent for the magically powered Kahndaqian. Adding to his comments about Black Adam's place in the DC Cinematic Universe, Dwayne Johnson also noted that although he will be Shazam’s nemesis, Black Adam will grow into being an anti-hero, and that his character development and history is "written within the spirit of respecting and paying homage to the comics." This is in reference to what's been going on in recent years, which have had Black Adam morphing into a complicated individual that wants to what’s best for his people, but goes about it in questionable ways. If Black Adam has morphed into an anti-hero by the time he throws down with the other DC heroes, it’s possible it will be because he’s trying to dish out his own brand of justice, and the Justice Leaguers don’t approve. We’ll see Black Adam for the first time when Shazam hits theaters in 2019.